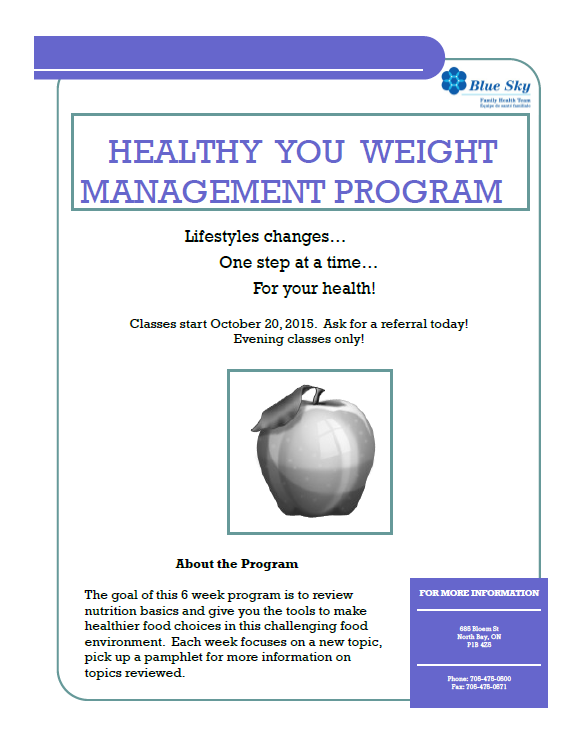 The Healthy You Weight Management Program is a 6 week program that focuses on lifestyle changes that may help you to reach and maintain a healthier body weight or shape. You will learn about how nutrition, physical activity, the environment and your behaviours affect your body size. You will learn how to use this information in your day-to-day life by working with other group members and doing practical activities and learning from each others’ experiences. The aim of this program is to help you make permanent lifestyle changes. This is not a program that focuses on “dieting”. You set your goals and make a plan that works for you. For more information take a look at the healthy you pamphlet. A referral is needed from your family physician or the purse practitioner to attend the Healthy You Weight Management Program.